A devoted morris-girl, set-dancer and all-round dance enthusiast, there's no-one better qualified to get you dancing your socks off! She has a growing reputation in her own right as both a singer and a songwriter (BBC Folk Awards finalist! ), winning several awards as a solo artist and recently launching her EP ‘Somewhere North’. She also finds time to perform with top London-Irish band, Crossharbour, who have recently launched their eponymous debut album to critical acclaim. Having grown up in the foothills of the Burren on the west coast of Ireland, Rowan has traditional music in his blood. A familiar face in ceilidh bands across the UK and a constant of the Irish session scene, Rowan also finds time to play at folk clubs & festivals with ﻿Rosie Hodgson and Georgia Lewis & Friends.  A serial compiler of tunebooks, his book of Irish Céilí Tunes is available at all our céilís and is actually the basis of the Causeway repertoire. ​Georgia is a multi-instrumentalist from the depths of Wiltshire. Classically trained, she studied for her degree in Professional Musicianship at the Brighton Institute of Modern Music a.k.a. BIMM (where she befriended Rosie). ​ She fronts her own folk band Georgia Lewis & Friends, playing folk festivals & clubs all over the UK, as well as running a function band (The Redjacks). When it comes to dancing, nothing is more important than good rhythm, and Felix has it in bucket-loads. Having grown up in Andorra, his spell-binding guitar style didn't have the chance to blossom until he moved back to England to study music at Stratford College, but since then he's mastered everything from heavy rock on an electric, to the subtle finger-tapping techniques of Andy Mckee. He currently plays with Georgia Lewis & Friends.